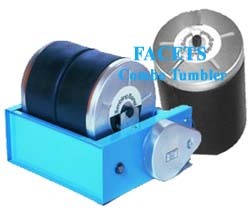 How to choose a Rock Tumbler.  IT'S BACK The Gem Scoop - NEW!  Extra Heavy Duty Commercial 65 pound capacity Rock Tumbler!  Lortone spare parts for your tumbler!  Rough rock for tumbling.  Bulk Grit & Polish for your rock tumbler. Professional quality rock tumblers or polishers for the novice or industrial use...not toys and are intended for use by or under the supervision of an adult. Be assured you won't find any plastic constructed rock tumblers or polishers here! All tumblers listed here are all steel constructed with 110V motors, however export models can be special ordered! From our small well-built rock tumblers to our larger heavy-duty tumblers and polishers these are meant to last you for years of enjoyment making beautiful mementos of your collecting. At Wesley's Trading Post we feel the following tumblers are the absolute best value for your money on the market today. Internet Special...Plus all of our (3lb. - 12lb.) tumblers include not just a one-year limited warrantee by the manufacture, but Wesley's Trading Post Extended Motor Warranty* giving you a full 2 year warrantee! *Walk-ins must mention this offer at the time of purchase to receive the additional extended motor warranty offer. Our tumbler KIT packages feature a quality heavy duty, professional rock tumbler/polisher and instructional guide plus the Wesley's Trading Post complete lapidary kit which includes all the necessary supplies to grind and polish 24 to 30+ (not just 10-14) pounds of rock. 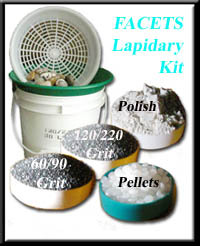 < - - Our durable molded high density polyethaline non-scratch separating *screen (fits any 3½ or 5 gallon bucket) to make clean up of your **stones a snap, and the easiest way to recover the plastic pellets, without scratching the polish on your stones as metal screens can. *Screen styles may vary depending on availability. ½ lb. pkg. of reusable plastic pellets. Plus the "basic" 3- step stone finish kit: . 2 lbs. - 60/90 Silicon Carbide course grit. 2 lbs. - 120/220 Silicon Carbide med-fine grit. 2 lbs. - Tripoli Polish. **Bucket and Tumbling Rocks NOT included. The following units are used by professionals and hobbyists alike. They all come complete with a tumbling instruction Guide plus our own year round (7 days a week) customer support to make your rock tumbling a fun, fascinating, and educational hobby that can make a great gift as well. These durable machines come complete with a detailed instruction Guide and have an all metal base construction which support a thick rubber or rubber lined barrel which makes for a compatible operation with your normal home or RV life! Perfect for those just getting started. Plus you get OUR NEW FREE Extended Motor Warranty . 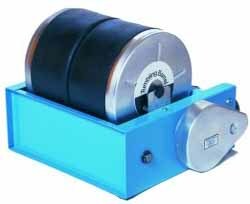 The following rock tumbler/polishers are perfect for rockhounds of all ages, however they are not toys and are intended for use by or under the supervision of an adult. 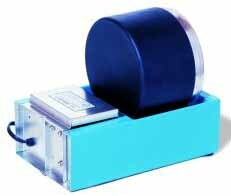 < - - Lortone Model 33B Tumbler only (as shown). Heavy duty, professional quality tumbler with twin 3 lb. capacity barrels. Inside barrel opening diameter is 3 7/8" by 4 1/8" deep, unit comes fully assembled and measures: 6 ¼" x 16". Excellent for keeping the grinding and polishing barrels separate. Allows you to grind and polish smaller loads of stones the size of a quarter and smaller at the same time. Plus you will receive Wesley's Trading Post Extended two-year motor warranty and the complete Step - By - Step Guide to Tumbling Gemstones. In Stock and ships immediately, shipping weight 8 lbs. #004-091 - NEW List Price $144.50. To order NOW! Only $130.05. Plus Shipping and handling. Lortone Model 33B Rock Tumbler (tumbler as described above plus) + Wesley's Complete Lapidary Set-up Kit Internet Special... (Includes: 3 step tumbling media kit to grind and polish 24 to 30+ pounds of rock, 1 pound of reusable plastic pellets and separator screen as photo above for your rock tumbler). In Stock and ships immediately. Shipping weight 18 lbs. $164.55 - Buy it NOW! Plus Shipping and handling. 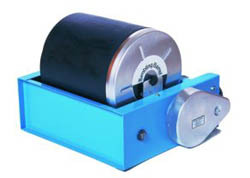 Lortone Model 45C Tumbler only (as shown). This is a more useful size for medium sized loads or larger material up to 3¼" (size of a tennis ball). Lortone's single 4½lb. barrel features a 10-sided interior surface (measuring 5�" by 3�" deep) for optimum tumbling action and a capacity for 5 cups of rocks. Base frame dimensions measure 6¼"x10¼" and the motor is internally fan cooled. Plus you will receive Wesley's Extended two-year motor warranty and the Step - By - Step Guide to Tumbling Gemstones. In Stock and ships immediately, shipping weight 7 lbs. #004-092 - NEW List Price $144.50. To order NOW! Only $130.05. Plus Shipping and handling. Lortone Model 45C Rock Tumbler (tumbler as described above plus) + Wesley's Complete Lapidary Set-up Kit Internet Special... (Includes: 3 step tumbling media kit to grind and polish 24 to 30+ pounds of rock, 1 pound of reusable plastic pellets and separator screen as photo above for your rock tumbler). In Stock and ships immediately. Shipping weight 18 lbs. $164.55 - Buy it NOW! Plus Shipping and handling. Lortone Model 45C Rock Tumbler KIT + ADDITIONAL...Best Buy! All of the above plus double the grit. In Stock and ships immediately. Shipping weight 22 lbs. Buy it NOW and SAVE! Just $180.55. Plus Shipping and handling. The same outstanding performance as our smaller tumblers, these are perfect for larger items and moderate production use. The larger units come complete with a detailed instruction guide and are built with welded steel frames featuring Lortone's patented (quick-seal leak proof closure) molded rubber barrels that provide a 10-sided interior surface for optimum tumbling action plus a continuous heavy duty, fan-cooled motor with overload protection. Plus you get OUR NEW Extended Motor Warranty. Lortone Model QT66 Rock Tumbler (tumbler as described above plus) + Wesley's Trading Post Complete Lapidary Set-up Kit Internet Special... (Includes: 3 step tumbling media kit to grind and polish 24 to 30+ pounds of rock, reusable plastic pellets and separator screen as photo above for your rock tumbler). In Stock and ships immediately. Shipping weight 27 lbs. $259.05 - Buy it NOW! Lortone Model QT66 Rock Tumbler KIT PLUS...Best Buy! All of the above plus enough supplies to polish 15-16 loads of rock. In Stock and ships immediately. Shipping weight 41 lbs. Buy it NOW and SAVE! Just $314.05. 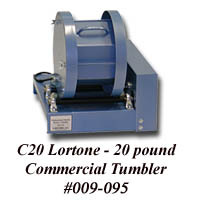 Lortone Model QT 12 Tumbler only (as shown), is a large single 12 lb. capacity barrel (inside barrel opening diameter is 6 ¾" by 7½" deep), for those big loads or larger items up to 5". Base dimensions measure 13" x 12½". Plus you will receive Wesley's Trading Post Extended two-year motor warranty and the Step - By - Step Guide to Tumbling Gemstones. In Stock and ships immediately, shipping weight 18 lbs. #006-091 - NEW List Price $235.00. To order NOW! Only $211.50. Plus Shipping and handling. Lortone Model QT 12 Rock Tumbler (tumbler as described above plus) + Wesley's Trading Post Complete Lapidary Set-up Kit Internet Special... (Includes: 3 step tumbling media kit to grind and polish 24 to 30+ pounds of rock, reusable plastic pellets and separator screen as photo above for your rock tumbler). In Stock and ships immediately. Shipping weight 25 lbs. $246.00 - Buy it NOW! Lortone Model QT 12 Rock Tumbler KIT PLUS...Best Buy! All of the above plus enough supplies to polish 8 loads of rock. In Stock and ships immediately. Shipping weight 40 lbs. Buy it NOW and SAVE! Just $301.00. Lortone Model QT12/66 COMBO Rock Tumbler & Polisher (tumbler as described above plus) + Wesley's Trading Post Complete Lapidary Set-up Kit Internet Special... (Includes: 3 step tumbling media kit to grind and polish 24 to 30+ pounds of rock, reusable plastic pellets and separator screen as photo above for your rock tumbler). In Stock and ships immediately. Shipping weight 32 lbs. $338.55 - Buy it NOW! Lortone Model QT12/66 COMBO Rock Tumbler/Polisher KIT PLUS...Best Buy! All of the above plus enough supplies to polish 8-16 loads of rock. In Stock and ships immediately. Shipping weight 47 lbs. Buy it NOW and SAVE! Just $393.55. 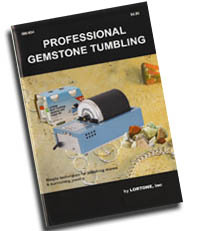 Professional Gemstone Tumbling - Revised edition - A well documented STEP- BY- STEP Guide to Tumbling Gemstones includes all the grit and polish recipes for all size tumblers! 20 Pages. In Stock and ships immediately. Shipping weight 4 ozs. #580-034 - $4.50. These items are NOT being drop-shipped by another party. We have these in stock and will ship immediately - directly to you! Product availability & prices subject to change without notice. How to choose a rock - - > Tumbler | Tumbler sizes vary from: | Small tumble polish material up to 1" | Larger 6-12 lb. tumble material up to 3" | Most Versatile Tumbler | Special Order Industrial 20, 40, 65 pound capacity tumblers. 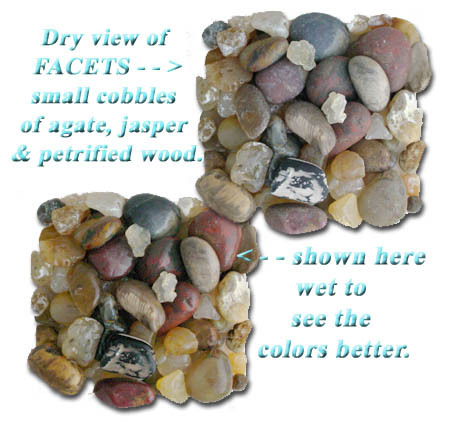 © 1999 - 2018 4FACETS.com, All Rights Reserved.